I don’t know much about my readers, including the homes you grew up in. I am sure that if you were to respond to a survey about your childhoods and what kind of upbringings you had the answers would run the gamut from safe, loving homes to homes rife with dysfunction ~ I assume this because of the law of averages. However, the next time you get really angry with your parents or resentful of mistakes that they made when you were a child (or the mistakes they still make, for that matter) take my advice: stop, breathe, and think about the story below the fold. It appears that eHarmony now has to put up a gay matching site in the wake of a lawsuit from a homosexual who felt that they were discriminating against him. Apparently, all of those eHarmony commercials he saw on TV of smiling, heterosexual couples made him want to join the fun. I would sympathize with, and even support the protest of a gay man or a lesbian who was discriminated against by a general business or service provider, such as a restaurant, store, or hospital that refused them service. But for the life of me I don’t see how a dating site catering to heterosexual couples constitutes discrimination. It’s a specialty service; in a facet of life as complex as romantic relationships, one size does not fit all. Would you sue your dentist for not giving you an ear, nose, and throat exam? Would you sue McDonald’s for not offering pizza? I would assume that the web is crawling with gay/lesbian dating sites (I aint about to go looking for them though). Did it occur to Mr. McKinley to try one of those? No, he decided to sue a private business that doesn’t draw one penny from the government because they didn’t realize that it’s about him too. And by the way, eHarmony had to pay him $5000 as part of the settlement. Talk about money for nothing. Mark Elrod, a political science professor at Harding University (my Alma mater), has had a very popular weblog for several years where he, his colleagues, alumni, and other interested parties could discuss issues of the day. This from his post announcing why he is making his blog private. Kind of makes a mockery of Harding’s pretensions of academic excellence and freedom, right? Let’s clarify that despite his controversial political and social views, Elrod is a believer. Not once has he denied the existence of God, the divinity of Christ, or the authority of scripture. He deserves to be treated like a brother. Yet far too many of his readers, presumably Christians, have gone running like schoolyard sissies to the HU administration because big bad Elrod said something they didn’t like. Boo-friggin’-hoo. I didn’t always agree with him; but I enjoyed his Political Science class as an undergrad for the same reason I enjoyed his blog; he made me think. You know, like good teaching and writing is supposed to do? Sad stuff. This is yet another reason why HU won’t ever get dime one from me. Elrod has posted a clarification of the matter on his blog. I want to make it clear why I’m making the switch from writing a public blog to a private blog. I’ve been fielding questions all day about this and I think it may be better to deal with it wholesale rather than retail. For the record, I was not “pressured” by anybody to change my blog from “public” to “private” status. I made this decision on my own as the result of the general frustration I have with members of our fellowship who want to make a spiritual judgment about me based on my political views. One of those views is my public support for Barack Obama for president. In the last few days, much of that angst has been directed toward my employer and, as a result, toward me as well. Because of this, I have decided that I would much rather have a private conversation about things that are important to me rather than a public conversation that leads to additional complaints about me to the Harding University administration. I suspect that this arrangement is going to be beneficial to all of the parties involved. So he is sick of people gunning for him and questioning his convictions simply because he supports Obama for president. Well, he is still within his rights. I know from experience (admittedly, on a much smaller scale) that it can be very hurtful when people question your character, integrity, and very commitment to the faith just because you have an unpopular opinion on a peripheral matter. Regardless, Elrod says the school didn’t bust his chops and my respect for him dictates that I take him at his word. So be it. I was wrong, at least on that point. Look for me to eat a little crow in my next post. Proving once again my truism that small people fight small battles, a group billing itself as “The Resistance” is protesting Starbucks’ current use of it’s original logo. First of all, anybody in America who calls themselves “The Resistance” deserves an open-handed pimp slap. Resistance, in its proper context, is used for people who oppose fascist regimes at great risk to life and limb. Kids, having an unpopular opinion does not automatically make you a rebel or a hero. Can we all handle this? Secondly, what are they resisting? A logo? Wow, way to take a stand there, Bonhoeffer. Personally, I can think of a lot of other things that merit “resistance” if we use the term like they are. Starbucks prices, and those ubiquitous clowns who spend their entire day at Starbucks writing the next great American novel on their laptops. Geico, for continuing with those stupid Caveman ads long after the not-that-funny-to-begin-with joke has run its course. You get the picture. What about you, gentle reader? What do you think merits “resistance” in our popular culture? JONESVILLE, S.C. (AP) — A South Carolina pastor says he wasn’t trying to be politicalwhen he posted a sign in front of his church linking Democratic presidential candidate Barack Obama and al-Qaida leader Osama bin Laden. 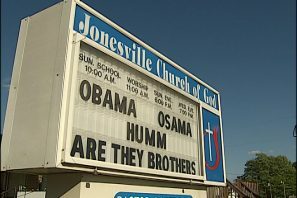 Pastor Roger Byrd said he just wanted to make people think when he put up a sign reading “Obama, Osama — humm, are they brothers” in front of the Jonesville Church of God on Thursday. WYFF-TV reported Monday on its Web site that Byrd said he won’t take the sign down. He said his congregation voted unanimously Sunday to keep it up. The church is part of the Church of God, a Pentecostal denomination based in Cleveland, Tenn., according to the organization’s Web site. I am within spitting distance of this semester’s end. No more Dr. Sunshine. No more getting up at 2:30 in the afternoon to make my 4 o’clock class after working until 8:30 that same morning (and then going back into work for another 10 hour shift). No more going 36 hours without seeing Christine. Two more papers stand between me and the home stretch for this degree. And for the life of me I cannot push myself to finish them. I don’t really know why this inertia has settled on me, although I have some guesses. Part of it may be knowing that I have to take a summer elective that will start about two weeks after the spring semester ends. Part of it may be knowing that next year I will have to do my final internship. This will entail 21 hours a week (location to be determined; when I know, you will know). “But wait,” the observant reader interjects, “don’t you have to work?” Why yes, I do. How will I accomplish this? By working every Friday and Saturday night as well as two nights during the regular week. With the exception of the occasional holiday, I will either be at my paying gig or my internship. I am looking down the wrong end of a school year without a day off. Part of it may be that due to our current non/maybe recession, I may graduate next year into…the same job I have right now. It’s a sweet gig for a student, but I have already had enough and I want out; no more night shift and preferably, no more shift work at all. Part of it may be that my brother-in-law Steve sent me the artist line-up for this year’s Austin City Limits Music Festival and it looks fantastic. Of course, it’s in September; right after I start my internship. I shouldn’t whine, I know. Many people who would love to attend graduate school never get the chance to do so. My wife has never, ever complained about the sacrifices she has had to make, first dating and then being married to a student. Although I am not crazy about my job, I was lucky to get it when I did for a number of reasons. But I wish sometimes that I had all of this behind me. I wish that I had not sunk 10 years into the wrong line of work (for me) when I was younger. I fear that I am teetering on the edge of burnout. Any suggestions for coping would be welcome at this point.